Welcome to Ecotourism Japan ! What does it mean "to revitalize communities"? We are a non-profit organization, aiming to revive communities with ecotourism. 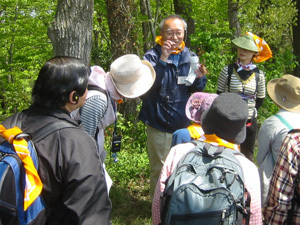 What kind of organization is Ecotourism Japan? 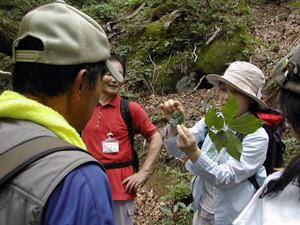 Ecotourism Japan (EJ) is a non-profit organization working to establish a nationwide network of tour operators, researchers, and professionals, with the aim of revitalizing local communities through ecotourism. 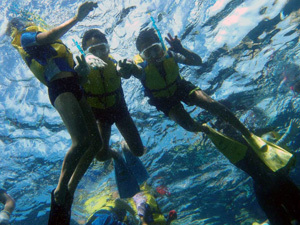 To promote ecotourism, we support local communities and tour operators. We also run the web portal "eco-tour.jp", disseminating information and tips on ecotourism, nature-based tours, conservation and more, to encourage more people to learn about ecotourism. What exactly does it mean to revitalize communities with ecotourism? And what is "ecotourism" anyway? How is it different from an "ecotour"? Simply put, an ecotour means an environmentally-friendly tour. An ecotour tries to minimize negative impact on the natural environment and the unique local cultures by balancing conservation and tourism. While "ecotour" is the type of a tour, the word "ecotourism" is the concept and principles behind what make a tour an ecotour. OK, so what kind of concept is ecotourism? Different countries, communities, organizations and even individuals may have different definitions of ecotourism and different interpretations of the definition. In the US and many European countries, nature-based tourism in national parks is popular, and the idea of ecotourism is closely connected to properly managing the natural environment and tourism activities in order to maintain the land in a sustainable manner. In Japan, however, the emphasis is often on finding ways to co-exist with nature through interaction with the local environment. Uh-huh, I think I get it. In Japan, ecotourism is not limited to nature-based tours but includes tours that focus on experiencing local lifestyles, learning about the culture and history of a place, and supporting locally based industries. So you will likely find ecotours taking place not only in national parks, but also in a wide range of areas including satoyama*, satochi, satoumi, and even sometimes right in the middle of Tokyo. The concept of ecotourism is often interpreted in Japan is as a tool for local community development that utilizes various local resources. An even broader view of ecotourism would also consider environmental education and 'cultural exchange' between urban dwellers and rural communities can as a part of ecotourism. Wow, that is a very broad concept. By the way, I often hear the word, "green-tourism". Is this ecotourism as well? We can say it's also part of ecotourism. The term "green tourism" in Japan refers to tours incorporating agricultural experiences, so it's a specific type of nature-focused tourism. Ecotourism is not defined by where the tour takes place, which is different in the case of green tourism. Green tourism is usually, but not always, low-impact tours. What is like in a community that lacks vitality? So, how is EJ trying to revitalize communities with ecotourism? Well, what comes to mind when you think about communities that need to be revitalized? Hmm... I guess it's when young people move to the city and nobody's left to take care of the farms? Exactly. A 2006 survey by the Ministry of Land, Infrastructure and Transport found that 62,273 communities in Japan are considered "under-populated", 4.2% (2,634 communities) of which are expected to die out in the near future. Of those, 423 very under-populated communities are thought to disappear within the next decade. These under-populated communities are of course facing serious challenges, but even in villages that are expected to survive are grappling with problems such as abandoned farms and properties, deforestation, and illegal dumping. Professor Akira Ohno of Nagano University has warned that villages where more than half the populations are 65 years and older should be considered as "merginal village" or "endangered". Moreover, he predicts that more and more communities -- not just small-scale villages, but also larger villages, towns and districts with ageing population -- will be facing the danger of extinction. Wow, that's a severe situation. But with Japan's declining birth rate and growing aging population, isn't it natural that some rural communities can't survive? What's the point of using taxpayers' money to try to preserve villages with few people? Elderly people can live happily and safely living together in cities, can't they? Well, if all these rural communities died out, what would happen to the forests and farmlands without people? Workers can commute from the city to tend to the land in rural areas, if, for example, forestry or agricultural corporations are established. That way, we may support forestry and agriculture industries by attracting many young people. Working in agriculture and forestry is not as easy as that. You can't forget that working with living beings -- crops and forests -- means constant care is required and it's not something you can do as a commuter. It's true that there is an increasing number of agricultural corporations, but corporatization does not offer solutions to declining forests in under-populated villages without good infrastructure or small-scale fields on mountain slopes being abandoned. Also, it takes a lot of time for abandoned land to regain the fertility of its soil. You know Japan has a very low self-sufficiency rate, right? It's about 40%, which is the lowest among developed countries. We cannot depend entirely on imports because there will be concerns over food safety, which will likely continue to increase, and it's also possible that we lose our capacity to import food due to factors such as the global population growth, higher oil prices, and the yen's weaker exchange value. According EJ Board member Mr. Takashi Fukui, many small-scale family farms are growing crops for their own consumption, and though often not reflected on official statistics, their production amount is quite large. There are a lot of people who receive care packages consisting of vegetables grown in their hometown. As you can see, rural communities dying out and farmlands being abandoned are not just isolated problems, but can lead to food crises across the country. I see. It's not like our food is grown in convenience stores. My grandma sends me vegetables and rice too, and it helps me a lot. But that's not all. Illegal dumping, which has already become a serious issue, is likely to increase in uninhabited places. If toxic matters are improperly disposed upstream and the soil is contaminated, what will happen to our drinking water...? The beautiful landscapes of rural Japan can only exist with people taking care of the communities they live in. 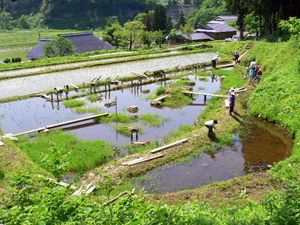 Without human inhabitants, rural communities will lose their terraced rice fields on mountain slopes and forests passed down over generations, which may lead to landslides burying rivers. Then, the lower reaches of the river will not have the stream, which can lead to water supply crises in cities. Wild animals living in mountains like bears, boars and monkeys, will start coming down to abandoned villages and damage the land if nobody lives there. On abandoned fields plant diseases may occur more easily, which would necessitate the use of pesticides, which would otherwise be unnecessary. We talk about how the natural world is all connected, but it's not only nature; human communities, rural and urban areas are also connected to one another. So are mountains. Although mountains and forested land cover about 70 percent of the land in Japan, forestry workers can't sustain their livelihoods selling domestic wood products due to high costs. There are, not surprisingly, fewer and fewer people who work to in forestry and look after our mountains. People in rural areas still do work hard to maintain mountains in decent conditions, but many of the workers are already old and these mountains are deteriorating as we speak, leading to the decline mountains' natural ability to store water and absorb carbon-dioxide. 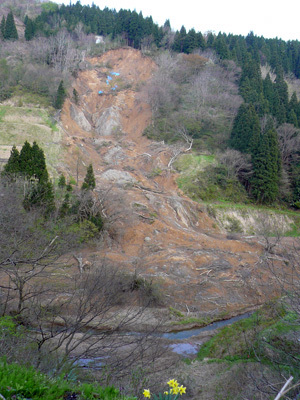 This causes disasters such as landslide, flood, and water shortage, affecting both rural and urban areas. Only about 20 percent of woods used in Japan are produced domestically, and the rest imported from other countries, where deforestation is a serious environmental concern. We are able to buy timber and wood pulp from these countries that need the money, but it's egoistic of us consumers in Japan to not care about the environment in other countries. I agree. Those problems in foreign countries are our own problem connected to our lives, whether we realize it or not. Right. Back to the population issue in Japan, there are also concerns about bringing people from rural areas to cities. Leaving a place they consider home must be stressful and it's sometimes hard to re-establish meaningful and fulfilling life in a new place. In addition, the "working poor" phenomenon -- where an increasing number of workers who maintain regular employment remain unable to escape poverty because of low income -- is becoming a prominent problem especially among young people today. Having no hometown -- a "safety net" -- to fall back on is one of the reasons these people become stuck in the "working poor" status. Urban life is indeed convenient, but it easily isolates people and living comfortably is difficult without a lot of money. To give up on rural communities because there is no tax income from there is like pushing the country to the edge of a cliff. Ours is a country with a lot of natural disasters like earthquakes. We can build a better and stronger safety net as a nation by focusing on spreading our population in a well-balanced manner rather than concentrating more and more people in urban areas. That being said, let me tell you how ecotourism can help empower rural communites. Yes, that's what I want to hear! It's important for a community to have a thriving young population to support the local workforce. Why do you think many young people are leaving their communities in rural areas? Because there are not enough employment opportunities in the community besides farming. I think they also leave for cities looking for more fun things to do. You can also see it this way -- they leave their hometown because they're not able to be proud of the farming traditions, rural cultures, and relationship with local community members including their own family. Right, if they are more attached to their communities, that could be a reason to stay. At Ecotourism Japan, we think that it's not only the young, but also their parents' and grandparents' generations are contributing this trend. When we visit rural communities, many of the elders are pessimistic about their community's survival and say things like, "there is nothing around here, not even a convenience store" and "Farming is too tough, we cannot force our children to work in farming." They often also say the only way for them to enjoy life is going to a pachinko parlor and playing gate ball. But what these people think is uninteresting can be amazing entertainment for visitors from outside. Beautiful mountains, satoyama, rivers and streams, fresh homemade food, traditional handicrafts, festivals, local customs, sound of breeze, songs of birds, chirping of insects, fireflies, lovely sunset, night sky full of shining stars, and warmhearted and friendly hospitality -- far from boring, the rural life is full of wonderful things that can never be experienced in cities. I know. That's why I like countryside. Rural people are so surprised and happy to hear such feedback from visitors, and t become very happy. In this way they realize that what their rural communities have -- their natural resources and cultural heritage -- is something they should be proud of and that people from the city would be envious of. They realize the value of what they've taken for granted when others show appreciation for it. That's where our ecotourism work comes in. We hope to help people find or renew their pride in their own communities. Through symposiums, lectures, ecotour guide and coordinator training, and Ecotour Cafe events, we offer opportunities for people to get together, share information and learn from each other. We want people to rediscover what they have in their own communities and to create new relationships and networks by providing these platforms. We were saying earlier that sometime it takes lessons from "outsiders" to open local peoples' eyes. Who from Ecotourism Japan are serving as the "outsiders"? Our "organizers" or expert advisers, who are leading figures in the field of ecotourism including community-based ecotourism professionals, researchers, educators and professors. 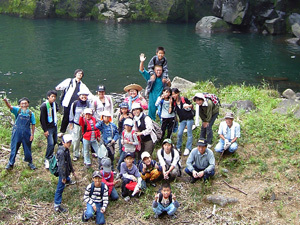 They travel throughout Japan to help revitalize rural communities through ecotourism projects. They have on-the-ground experience in community development and have practical skills needed to implement and establish ecotourism projects in rural communities. So these are supporters who bring much-needed positive energy to local communities, aren't they? And does EJ also create ecotours for local communities? Yes. We believe that if we successfully create ecotours together with the local people, they will have the opportunity to rediscover what makes their communities attractive. These ecotours are designed for everyone, young and old alike, to enjoy, and we hope that they will lead to more and more people rediscovering their love for their own communities. Ecotourism in rural areas, moreover, can encourage people living in urban areas to visit and appreciate the countryside, and that will promote ties between communities in rural and urban regions. In this way, ecotourism can contribute to the efforts to encourage young people to stay in rural communities by providing increased opportunities locally. Ecotourism can also be expected to help boost other industries affiliated to ecotourism activities, such as accommodations, transportation services, restaurants and gift shops. That sounds good, but is it that easy to plan an ecotour? No, it is not. But it's not just about selling tours. In the process of evaluating and discussing the local potentials for ecotourism, community members will have the opportunity to share their concerns and problems, and strengthen connections with each other. Even if a successful ecotour is not the end product, the planning process already contributes positively to the community by increasing hope for the future. If more people regain pride and live in their communities with joy, that will encourage development of local businesses such as green/agriculture tourism, local farm produce delivery, and cultural exchange between communities. As in the story of "Grandmas who Earn Two Hundred Million Yen with Leaves" by Tsutomu Kakuma which was presented at one of the Ecotour Cafe events in Tokyo, invigorated community members means big savings for local municipalities from decreased medical expenses. I remember the talk at the Ecotour Cafe event, too. I see that these gatherings are also opportunities for people to meet and connect with each other. It used to be very common for community members to get together with neighbors, friends and family members through the Yui gatherings (where community members participate in shared tasks) and "neighborhood association" activities. In recent years these customs are declining, and such local connections are increasingly becoming rare. Eco-tour Cafe is like a Yuntaku, which is a local term in Okinawa meaning a place where people gather and mingle with each other. When people are given opportunities to come together and share ideas, they can inspire each other to get engaged in new actions. Ecotourism Japan is promoting the Ecotour Cafe ideas in many places and hope to create more places for people to network and meet new friends. Sounds fun! I'd love to go to another Ecotour Cafe. When is the next one? The Ecotour Cafe events are held on first Thursday of each month in Tokyo, and Second Wednesday in Kobe. Besides these, you can find more Ecotour Cafe gatherings happening in many other locations in Japan. Cool, I will be there with my boyfriend next month!